Happiness is not just feel good, nice to have, fluff stuff. When we feel happier more often, we entirely change our beliefs about our world, what we can achieve, and ourselves. In every one of us there is this gap between what our lives are like now and what they could be; it is our untapped potential. We can bridge the gap between our potential and our performance by getting happier. 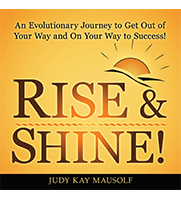 Judy Kay’s book was inspired by her work with dental teams for over 30 years! She wrote this book to help people get happier not just for the moment, but for a lifetime. She titled the book “TA-DAH!” because she teaches her friends, family, clients and audiences nationwide how to TA-DAH to feel happier in five seconds or less. TA-DAH is a philosophy that embodies principles, practices and pearls of wisdom on how to get happier. 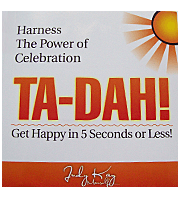 This book teaches you how to embrace the TA-DAH philosophy and harness the power of celebration. Click below to purchase a hard copy of this Ebook. 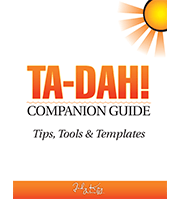 This valuable companion guide to “TA-DAH! Get Happy in 5 Seconds or Less”, presents a comprehensive and practical set of forms and a soft skills performance tracker to help individuals as well as teams apply the concepts and practices described in “TA-DAH! Get Happy in 5 Seconds or Less”. The TA-DAH Performance Tracker will allow you not only to track but to also quantify your results! It is designed specifically to assist anyone who wants to get happier and bridge the gap between their potential and performance! Use the forms as a guide in collecting and organizing your thoughts and action plans! The Performance Tracker will help individuals and teams measure their results! Today is the day to begin your new journey. Today is the day to Rise & Shine! 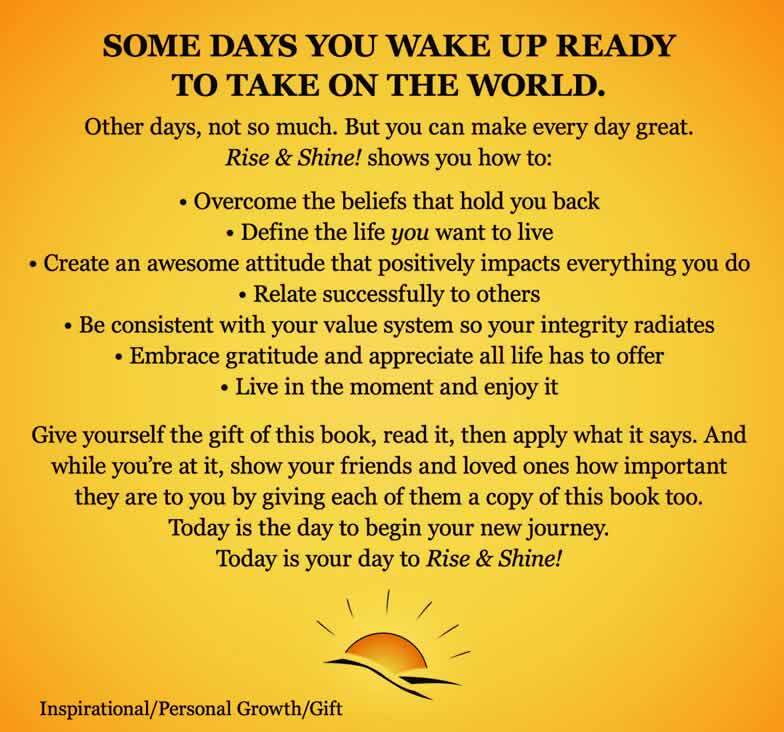 Learn how to create a happy, healthy environment and live a life you choose with Rise & Shine. 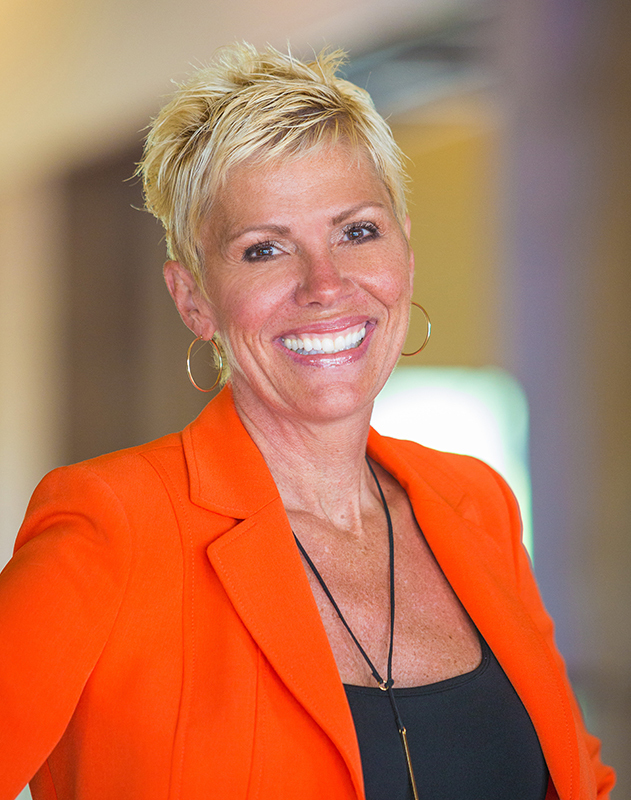 Judy Kay’s book was inspired by her work with dental teams over the span of 25 years. It is a working manual that inspires but also practically spells out the steps that truly successful people take to find amazing significance in life. Overcome the beliefs that hold you back. Define the life you want to live. Create an awesome attitude that positively impacts everything you do. Be consistent with your value system so your integrity radiates. Embrace gratitude and appreciate all life has to offer. Improve your practice and your life – apply the principles in Rise & Shine to everything you do! Want to inspire your entire team to make positive changes?